Would you build a model outside of your primary area of interest simply because the kit is excellent? For example, if you build jets, would you build a Bf-109 knowing it's nearly perfect? I am most tempted to stray when I see a really good example of an injected molded model. That's why I bought Eduard's Bf-110 and Revell's P-47D. These are outstanding kits. The former the perfect example of a state-of-the-art molding, and the latter an exceptional value. 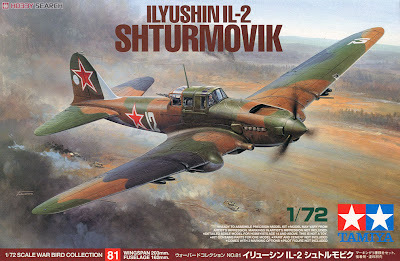 The most recent object of my intrigue is Tamiya's new 1/72 Il-2 Sturmovik. From the pictures on Hobby Search's web site, it appears to be yet another example of Tamiya's prowess at high-quality, high-detail kits in this scale, seemingly on par with their A6M Zero and P-47D. What I'm saying is, I'm a sucker for a high quality kit, no matter the subject. I'm a modeler. I find the process of building a model just as satisfying as what sits in the display case when I'm done, and the attraction to a new tool kit like the Il-2 is knowing that I won't have to struggle through the entire build. It will probably go together well, provide 90 percent of the detail I need to create a better than reasonable representation, and offer a unique and attractive model at the end of the day. How about you? Does a state-of-the-art kit entice you to build outside your area of interest? Yup. Matter of fact I've about decided to pick up one of these Sturmovik kits, even though WWII Japanese aircraft are my main interest. It's a cool looking and historically significant plane, and the kit reviews are so good that it's hard to resist. Other examples might be the Dragon P-61 in 1/72, for which I've acquired just about every piece of aftermarket there is, just for the sake of going down that road at least once, or the Dragon He-219 for much the same reasons. It's refreshing to step out of the usual frame and try something different.